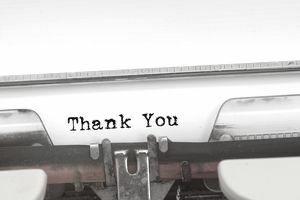 No matter what stage in your career you are in, thank you notes are highly valued. They can help you land an internship, build your professional network and set you apart from the crowd. However, one of the most overlooked occasions for a thank you is after receiving a rejection. After going through the long application process, interview stage and waiting to get a response, a rejection letter can sting. But while this particular opportunity has ended, your future is still wide open. Using this time as a chance to connect with the hiring manager or department head can help you later on in your career. Hopefully, after your interview, you got the business cards of the people you talked with. While you may feel silly reaching out to them; doing so can be a significant benefit to you. In conveys professionalism and graciousness on your part. The interviewers are likely to remember you in a very positive light and may lead to future opportunities. In some cases, they may know of positions at other companies that would be a good fit, so a thank you can lead to a job opportunity. Thanks so much for your note. I greatly appreciate the opportunity to apply for the editorial internship at your company. While I’m disappointed that I didn’t get the internship, I appreciate you taking the time to meet with me and review my materials. I wanted to take the opportunity to reach out and ask for any constructive criticism regarding my resume or interview skills. I value your opinion and would love to be considered for future opportunities. The note is short and to the point. It shows that you value the time the interviewer spent with you and her expertise in the industry. An interviewer will review a note like this with appreciation. If she does get back to you, take any advice or criticism very seriously; don't write anything off or ignore her observations. Any feedback is a priceless gift that you can use to improve your performance and interview skills to get a job later on. It is invaluable in building your professional skills. What If I Don't Get a Response? If you don't hear back from the interviewer, don't be disappointed or discouraged. Some companies have policies that discourage employees from speaking with former candidates, or the hiring manager may just be very busy. Once you send the thank, you note, mentally distance yourself from that role and that company and move on in your internship search. Remember, rejection is part of landing an internship or a job. You have to get rejected to eventually get to where you want to be. You may have to put out dozens of applications before getting an internship offer, and that is completely normal and is to be expected.